Isolation Host Mycobacterium phlei str. 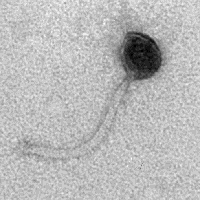 Discovery Notes Mycobacteriophage was found by Mother Cabrini High School students who participated in a 2012 Summer Research Camp at Cabrini College. Soil samples from all students were combined and enriched. Cabrinians was isolated using Mycobacterium phlei. It can infect Mycobacterium smegmatis. Naming Notes Named after Cabrini high school and Cabrini College.